Given how charged the atmosphere of the country is over the last two years in regard to the concept of race, I was looking forward to seeing Derek “Duck” Washington’s brainchild through Fearless Comedy Productions probably more than anything else in the Fringe this year. That’s why you’ll see Caucasian-Aggressive Pandas and Other Mulatto Tales at the top of my Top 10 list for 2016. The production itself was everything I’d hoped for and, naturally, more. Good artists always surprise me. I missed this show in its original run outside the Fringe so I was really happy to get a second chance to finally catch it. Duck is joined onstage by Matthew Kessen as our bumbling but reassuring narrator, Ted Femrite and Kirsten Wade as (among many other things) the vengeful pandas of the title with a taste for white meat (look out, fellow caucasians), and Suzanne Victoria Cross - who looked like she was having a heck of a time saying inappropriate things and making people uncomfortable with a smile on her face. Director Jena Young keeps things hopping, and gets the ensemble to strike that tricky balance throughout Duck’s script between serious subject matter, and not taking people or their prejudices too seriously. There’s some gasps, there’s some groans, there’s some anger on behalf of people who shouldn’t have to put up with such sh*t, but mostly there’s a lot of absurdity and laughter. Because, let’s face it, prejudice just makes everyone hanging onto it look stupid. The headings should give you a clue: Chapter 1 - How I Learned To Hate Mariah Carey; Aside #1 - Bill Cosby (“I didn’t think you could do anything worse than Leonard Part 6”); Chapter 2 - Caucasian-Aggressive Pandas; Aside #2 - The Chocolate Chip Cookie Game; Chapter 3 - Growing Pains; Aside #3 - More Awkward Interactions With White People; Chapter 4 - Checking Other; Aside #4 - Smells Like Teen Spirit; Chapter 5 - The Oreo Paradox. Duck takes his story growing up biracial and mines it for true life tales both silly and heartbreaking, and for comic situations like those hungry pandas who need him to prove that he’s more black than white (in ever more outrageous ways) so they don’t eat him; or the moment in the afterlife when he needs to choose a segregated heavenly reward. 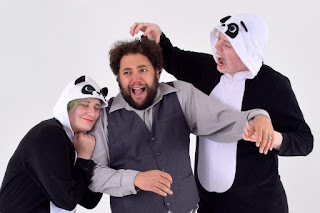 Caucasian-Aggressive Pandas and Other Mulatto Tales was everything I hoped it would be, and needed it to be. You should put it on your schedule.